I know that John Stevens will not lose his job - yet - and that Jason Smith will not be stripped of the Captaincy, but I sure as heck hope that those two get their heads together to try to figure this out. Another team meeting? Nah....Code Red time!!!!!!!!!!! I hope you can all sleep tonight, because I'm Mad as HELL and I'm NOT going to take it anymore!!!!!!!!!!!!!!!!!!!!!! That was brutal. At -20 whatever is anyone starting to believe what I have been saying since July 1st that Briere isn't a good fit for our team? We need to do something soon. First thing is we need to win a game. Great job as always SYF. I guess MHB didn't like my previous post. I'll try again: Do I need to make another visit? I'll put on my Flyers jersey this afternoon - maybe that'll bring positive results. We need you to take out the Sharks for us tomorrow, so let's get to it! Ray Harryhausen and "The 7th Voyage of Sinbad". (or "Jason and the Argonauts"?) If the Cyclops is really you - the new you, that is - then my cinematically derived advice would be to avoid blindfolds, arrows in the eyes, and cliffs. Nice post SYF - another brutal loss yet again. The boys decided to compete only in the 3rd period. 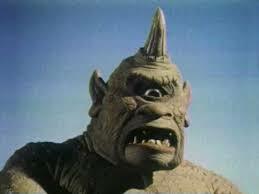 BTW I love the ode to Ray Harryhausen - man, we must be old to appreciate that reference! Stop motion cinematography forever! Anyway, has anyone heard if the Flyers are retaining the artist formerly known as "Gator"? I like his grit and determination, but there can be only so many silly turnovers you can stand out of your captain. I'd like to see them go after another dman (or perhaps bring one up) and move on. Anybody else? Remember the beginning of the season when us Rangers and Flyers fans were exulting together about our great acquisitions? Well, we are now worrying together as our teams are hanging on to playoff position. And to make matters worse, the Devils are in 1st. Together in joy, together in misery. Rags - I could not have said it better myself. Misery loves company.